Salt and pepper to taste (I prefer to use the Murray river salt flakes). 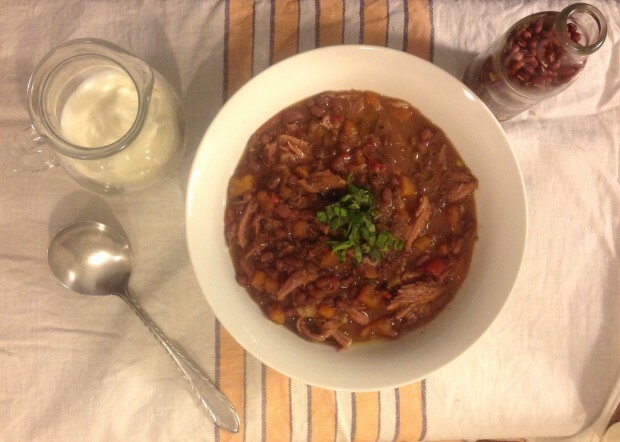 Place hock, beans, bay leaves and chicken stock in slow cooker ( making sure the hock is just covered) using powdered stock is fine – 1 to 2 table spoons depending on size of slow cooker, adjust to taste. The pork is salty so don’t over do it with the chicken stock powder. If using pre made stock add water to dilute to taste. Prepare and cut carrots, onion and capsicums. Then sauté with garlic and butter in a small pan – add to slow cooker. Add dried herbs, harissa, sumac, juniper berries and pepper to slow cooker. Season with pepper and a pinch of salt. Leave the slow cooker and let it work it’s magic for about 4 hours. When it’s ready is when the the pork falls away from the bone. Take the pork hock out onto a chopping board and using a fork to stabilise it shred the pork away from the bone with another fork to give a pulled pork look. Discard fat and bones. Add shredded pork to soup. Add rind, lemon juice and mandarin juice. Stir. Season to taste. Ladle into bowls, garnish with fresh basil and sage and Greek yogurt. Enjoy! Lentils (especially Adzuki beans) are close to my heart. My husband Evan is a grain and lentil farmer of Yarrawonga Victoria. Clontarf the family farm has been exporting Adzukis this year to Taiwan and Japan. This years sample was the cleanest and brightest yet of the samples graded on the East. I have loved bringing the raw produce home and making a hearty and healthy meal for my family. Evan gets a buzz being able to eat something he has grown too. We are looking at sending samples for sale to Wangaratta Wholefoods Store so local people can also share the health benefits of Adzuki Beans plus narrow the gap between grower and consumer over all reducing food miles. This exciting venture awaits.